Home / Entertainment News, Featured Articles / PHOTOS of DAVID, the main suspect in the attempted murder of Ex-Garissa Finance CEC who died inside Parklands Police station cells. PHOTOS of DAVID, the main suspect in the attempted murder of Ex-Garissa Finance CEC who died inside Parklands Police station cells. Friday, August 31, 2018 - David Mwai, the main suspect in the shooting of former Garissa County Finance CEC, died inside Parklands Police Station cells on Thursday under mysterious circumstances. According to police reports, Mwai committed suicide. The suspect had been arrested alongside 3 others after police reviewed CCTV footage showing how the former CEC was shot. Popular activist Boniface Mwangi has refuted police claims that Mwai committed suicide. He claims that Mwai was murdered inside the cell to conceal evidence that implicates Garissa Governor Ali Korane, who is the mastermind of the shooting. According to Mwangi, David’s wife is missing after being picked by flying squad officers from Parklands Police Station. 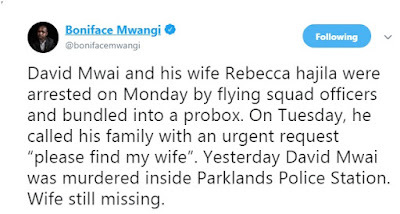 “David Mwai and his wife Rebecca hajila were arrested on Monday by flying squad officers and bundled into a probox. On Tuesday, he called his family with an urgent request “please find my wife”. Yesterday David Mwai was murdered inside Parklands Police Station. Wife still missing” Mwangi tweeted. 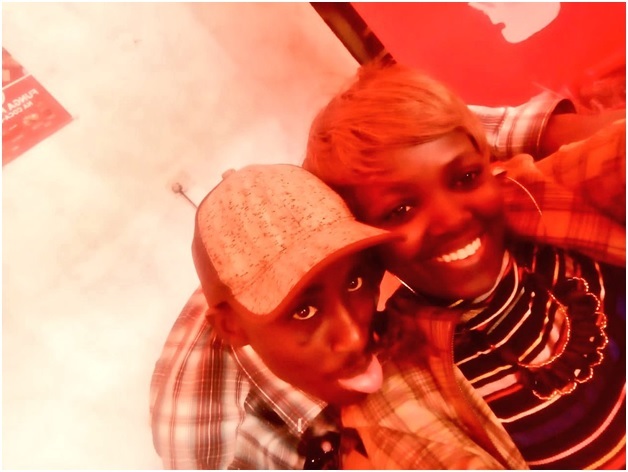 See photos of David Mwai, the main suspect in the attempted murder case of former Garissa CEC, who died under mysterious circumstances inside Parklands police station and his missing wife in the next page.